Lately, I have been making a concerted effort to eat more fish. As you know, I am a bit reluctant when it comes to seafood. It’s probably in part, due to the mediocre fish we have here. Of course, landlocked Colorado doesn’t see much seafood to begin with, but even when I was in Houston, close to the Gulf of Mexico, I didn’t care for the fish there. They enjoy eating catfish and I have to say, catfish tastes like mud. It’s quite disgusting. I do miss the excellent fish and chips of Great Britain and even though many try to replicate the ubiquitous dish here, they don’t quite get it right. Trace and the children, however don’t mind fish and I started thinking that I was being quite unfair. So I have literally pencilled in a day every week to make fish. This way I have time to research a recipe and have an idea of what do with said fish. Since fish is a quick preparation dinner, I planned it for Monday night when my husband is at home and when we enjoy watching Monday Night Football together. When he’s home, I hate spending hours in the kitchen and this was a fairly quick supper. 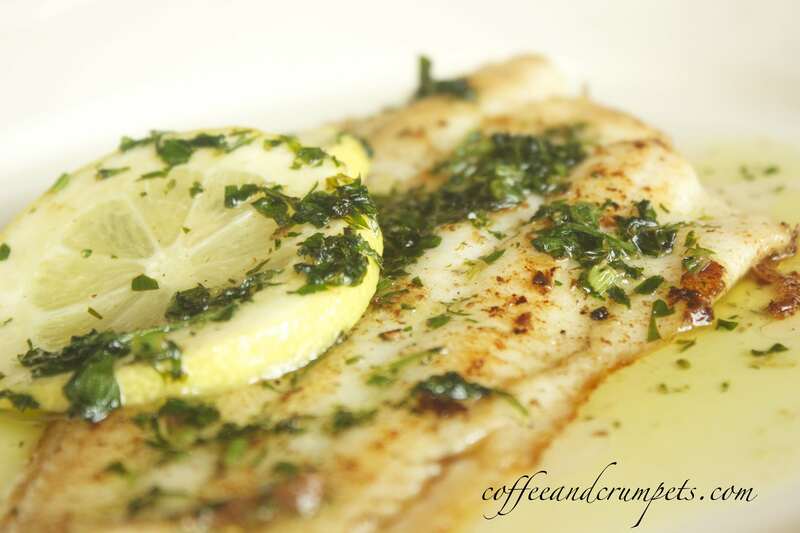 I had planned on cod but the shop had these awesome, incredibly fresh Dover sole fillets. I cannot resist sole, that’s one fish I do like. It’s such a delicate, sweet, mild fish and needs very little attention. 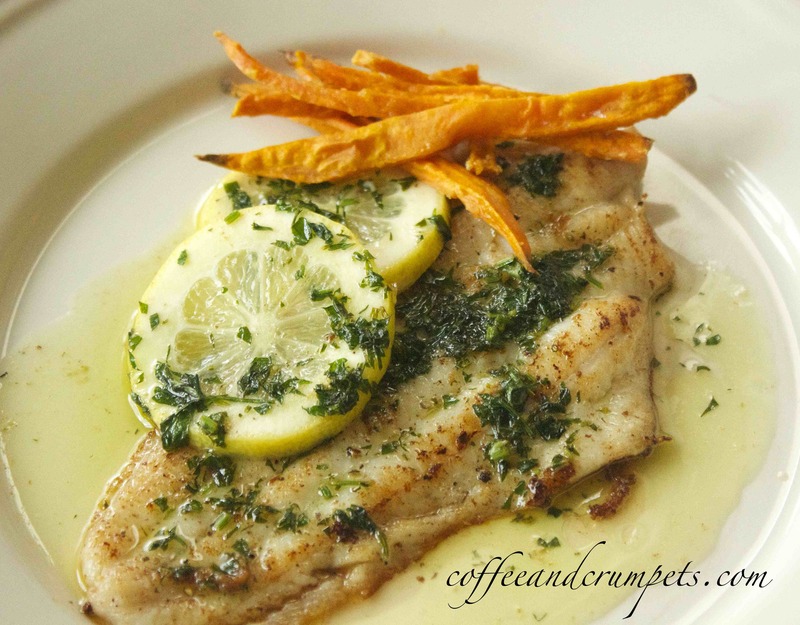 The way I like Dover sole is just simply, sautéed in butter with a fresh squeeze of lemon or as the French call it Dover sole meunière. It needs no fancy dressing up and all the sweet, buttery taste comes out with some lemon and parsley which is the classic preparation of a meunière sauce. I sautéed the sole in clarified butter, which is liquid butter without the milk solids (thats why the photos don’t show brown butter) If you don’t want to use clarified butter, just use plain butter and brown it a bit. It’s insanely good. I have given the recipe for brown butter. I also, didn’t dredge my fish in flour. My children don’t like the floury layer so I just left it off. Less work that way! I served it alongside some sweet potato fries and sautéed broccoli. Clean and dry the fish fillets. Heat a fry pan on medium heat. Add the 2 tablespoons butter and wait till the foam subsides. Drop in the fish fillets. It will only take 2 minutes or so if the fillets are thin. Add another minute if yours are thicker. Remove from the pan onto a plate. Add the remaining 2 tablespoons of butter, and let it turn brown, without burning. Squeeze some lemon juice and add the parsley. Spoon sauce over the fish fillets. Serve with more lemon if desired. This was a delicious fish dinner; very quick to put together. The sweet potato fries took the longest! All that chopping and slicing, but they were mighty tasty. I bought some fresh wild pacific dover sole yesterday which I had never had before. I made this last night and it turned out wonderfully. Both my daughters enjoyed immensely! Thank you for sharing it. Hi Nazneen – I love Sole! It’s one of my favourite fishes because it’s so delicate and thin, and fun to cook with too. Too bad you don’t get such good fish there. It must be tough being in a land-locked area. It makes me wonder if they eat much fish in the Czech Republic, in Europe for example. As for English fish and chips… I felt the same way once. I used to have dreams of eating salt and vinegar soaked battered fish and chips and yet when I returned to England for a visit, it was the first thing I ate and it was terrible, lol! Now I much prefer to make it myself! For being landlocked though, we still get a lot in! Also we have a lot of rivers so lots of trout…which I find a bit fishy. I should make my own fish and chips, but I hate frying SOOOO much. Also, my kids don’t like battered fish so I dont see the point of killing myself over it. My hubby and I end up going to a British chippy here, but they are not that authentic, they don’t even make their own chips!! Thank you Karen! I am so glad I stopped by yours! I think we Brits all love Dover sole. I ate it all the time while I lived there and i think that’s why it’s still my favourite. Such a light and delicious way to enjoy to fish! Love it! Thanks Asmita! 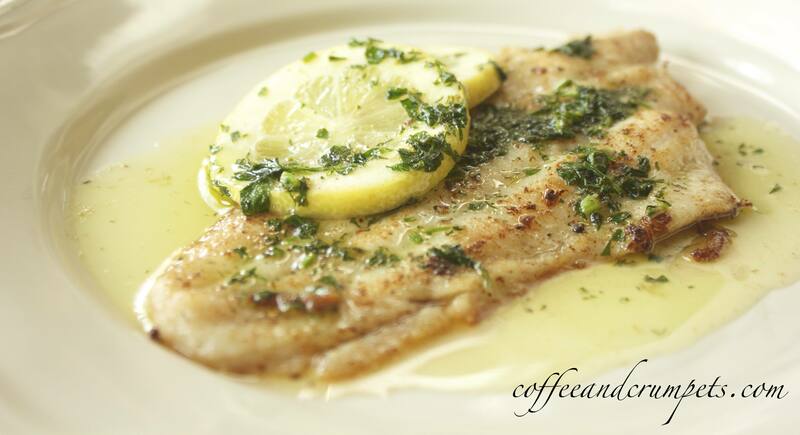 Sole is so light and delicate and sweet,lovely! Thanks Charlie, yeah, it isn’t easy but it gets flown in from wherever it is fish comes from! We get a lot from the Pacific area since Colorado is more of a Western State. However, we have a lot of river fish because we have rivers…trout and such. You must get good seafood in Australia. Wow, this looks like something off the menu of a fancy restaurant. Makes me want to eat some fish and I’m not even fond of seafood. Looks delicious! Thank you! If you don’t like seafood then this is the fish to try, it’s not fishy at all. Yum! I wish we could easily get more varieties of good fish here in Colorado. The best fish I can get is trout caught just up the road from my house. It’s best in the Winter when it is very firm and pink colored. Then one can prepare it “Truite Bleu.” I learned that from a French chef. When the trout is ABSOLUTELY fresh, the light sort of slimy coat it wears turns blue when you cook it. I used to bring him fish when my son went ice fishing. He loved it. The best fish I ate was in Greece, their restaurants are all lined up by the harbour and the seafood is on display outside. You pick what you want and they throw it on the grill. Can’t get fresher than that! Thanks Uru! There definitely was no hesitation in gobbling this up! I never really thought about this until I started getting the Good Food mag, how much seafood we have in the UK…duh, it’s an island! No wonder I ate a lot of good seafood in the UK but have trouble liking much here. One of the best fish dishes I ate was in Athens at one of the port restaurants. Have fun at Rick Steins! This looks so good! I’m definitely going to make it since I love dover sole. I grew up eating all kinds of seafood since I only lived about 50 minutes away from the ocean. I’m like you now, I live in Arizona and it’s hard to find good fresh fish. I miss the good ol’ days. Anyway, thanks for the recipe! Thanks Ana, I love this dish. For someone who doesn’t like seafood, I guess I like quite a few fish dishes! I would love to live on the Mediterranean just for good seafood.